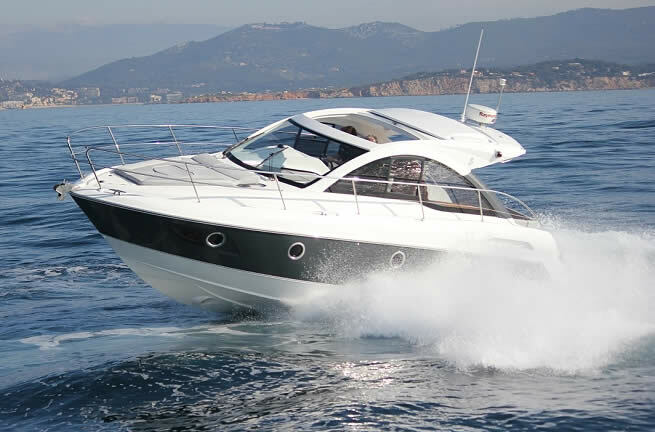 The GTs are designed for a sporty and demanding family wanting to discover what cruising is all about. The GT 34 follows the same philosophy and high standards as the Flyer GT 38. 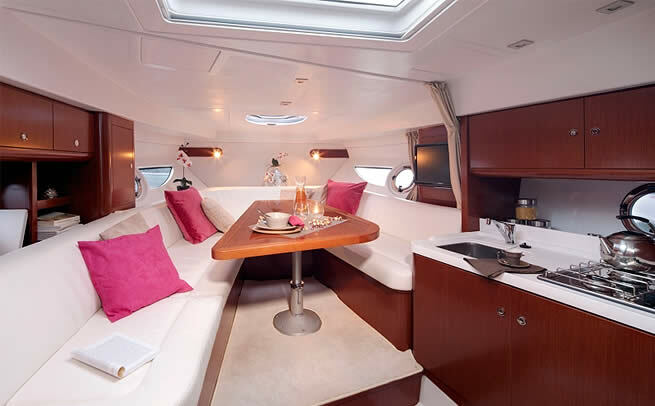 It enjoys in particular the same Mahogany Alpi interior wooden trims and white upholstery. For this twin-engine speedboat there is a choice between a Volvo 2x200HP Diesel or 2x300HP petrol engine giving a better speed of 30 knots. She is very easy to manoeuvre thanks to the Stern Drive propulsion and the Joystick offered on option. Enjoy the surprise of her spacious interior! She has 2 separate cabin spaces, as well as all the equipment necessary for your first time cruising with family or friends. 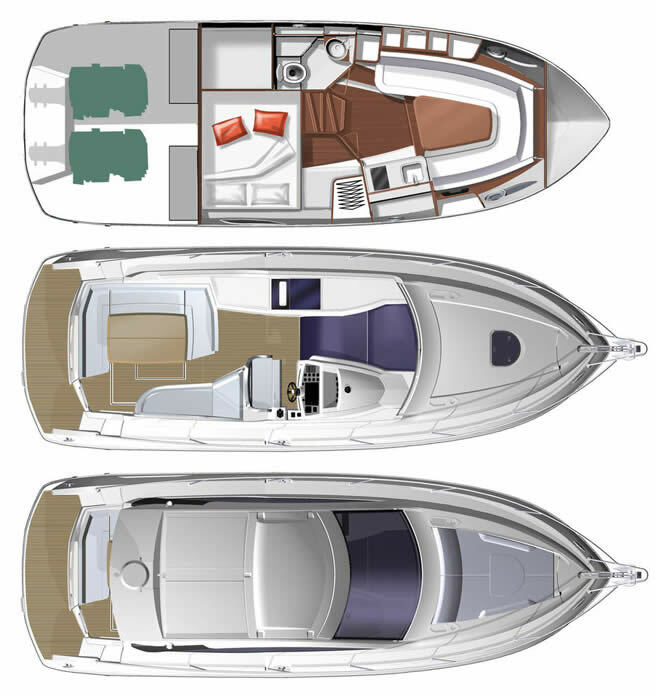 The FLYER GT34 enjoys 2 independent sleeping areas : a unique concept for a boat this size ! 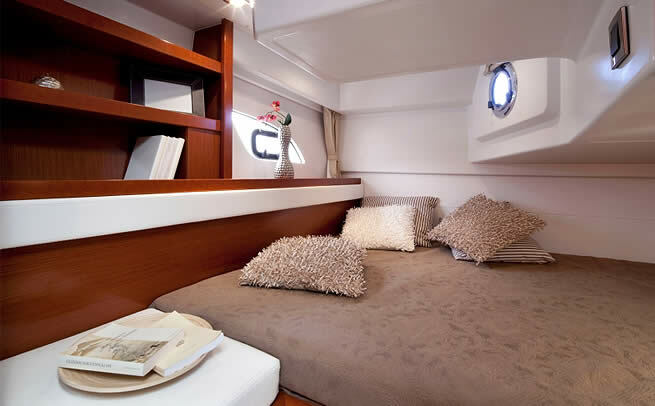 The separate aft cabin ensures total privacy, it enjoys a large opening over the water through the panoramic porthole and boasts a wide double bed 152 x 200cm. This cabin has a surprisingly spacious feel, particularly thanks the standing headroom (maximum 1,94m). turned into a double bed (by lowering the lounge table) and concealed by a curtain. 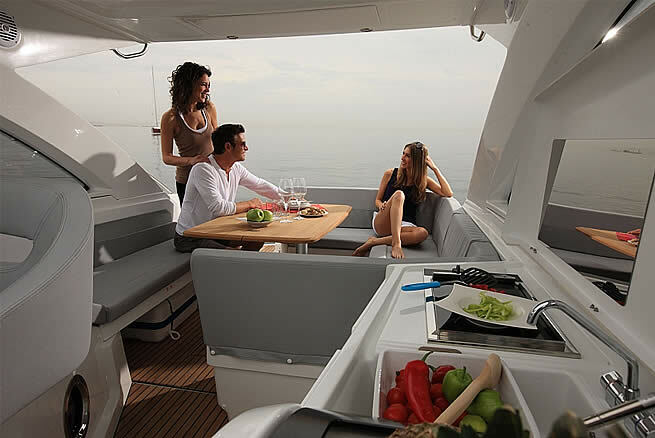 A roomy saloon which can cater for 6 people, perfect for dinner with friends or family. ceramic hob* and micro-wave* . A kitchen area, with grill* and 42L fridge*. The very high performance Air Step® ** hull gives the pilot unrivalled sensations, a perfect control of the boat and exceptional comfort.